Leslie (Fuller) Randall, a Newtown artist whose paintings graced galleries and public institutions over three decades, died December 27, 2000, in Danbury Hospital. She was 92. She was the daughter of the late Henry Jones Fuller and Nancy (Archibald) Fuller. Born Mary Leslie Fuller on March 30, 1908, in Montreal, Canada, Mrs Randall, who painted landscapes, portraits, and a wide variety of scenes, showed her works in dozens of private and public galleries, museums, libraries, and civic centers, such as the Riverside Museum, the Montrose Gallery, and the York Gallery in New York City, the Mattatuck Museum in Waterbury, Wadsworth Atheneum in Hartford, and Athene Gallery in New Haven, throughout western Connecticut and in New York City. During the 1940s, 1950s, and 1960s her works were praised by art critics in many newspapers, including The New York Times, New York Herald Tribune, Danbury News Times, The Newtown Bee, and Bridgeport Post, as well as in Cosmopolitan magazine. She attended Finch College and studied art at the Grand Central School of Art in Manhattan and the Academy Colarossi in Paris. She was a member of the Silvermine Guild of Artists in Norwalk and a former member of its board of directors. In the 1950s, 1960s, and 1970s she taught art to patients at Fairfield Hills Hospital, volunteered in the Danbury Hospital emergency room, and taught reading at the Danbury Senior Center. After her marriage to David Judson Randall, Jr, in 1930, Mrs Randall lived in Westport until his death in 1957. She moved to Newtown the next year, and had lived here ever since. During the Second World War, she volunteered for the Red Cross Motor Corps, providing transportation services for soldiers, and for veterans’ hospitals in New York and Connecticut, sketching free portraits of wounded soldiers to boost their morale. 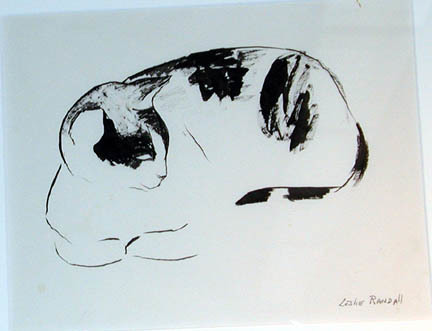 Randall, Leslie, “Sleeping Cat,” Westport Public Schools Digital Collections, accessed April 23, 2019, https://collections.westportps.org/items/show/587.